The developers of Long War, a mod for XCOM: Enemy Within, aren’t messing around. 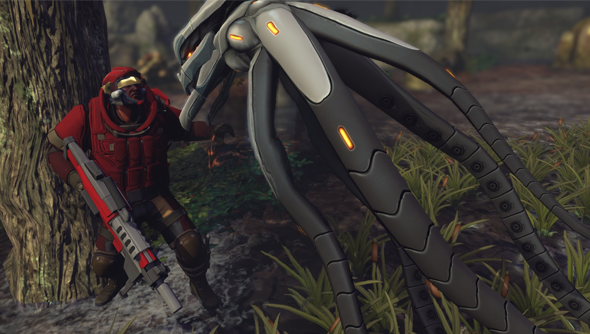 They’ve “removed every bit of code [they] can find that cheats for the player on the lower difficulties.” They’re looking to make XCOM more difficult and the alien invasion more realistic. Some of the changes they’ve managed to make are incredible, especially considering Firaxis haven’t released any mod tools. The modders say that while they “loved the vanilla game” they thought they “saw lots of opportunities within the engine for much deeper strategic and tactical play and a greater variety of problems to throw at the player.” Some of those changes include massive bump to alien HP and throwing late game aliens into the first missions you come across. Another is that your home country can be invaded in the first few months of the game, too. The modders have made it so the aliens have “an active strategy”. They aren’t simply responding to what you’re doing but “gathering resources and conducting research and going on other missions not directly related to XCOM’s operations.” This means that you’ll sometimes come across a large alien force in the middle of a big operation while you’re still woefully under equipped to deal with it. To give players an out in this instance the modders have added escape zones to most maps. If things are going south then you can try and retreat. Another significant change is a new system fatigue. Now, after a mission, “soldiers need to rest for several days to recover from the intensity of combat and exposure to strange alien chemistry.” You can still send them into combat if you must but they will automatically receive a light wound if they get back from the mission. This means they’re then unavailable till they recover. You can download Long War from Nexus Mods but keep in mind you’ll need Enemy Within to play it. If you’ve been playing with an earlier version of Long War you won’t need to restart your campaign but it is recommended. The complete feature list can be read on the next page. Most maps will now have start zones and escape LZs in new places. Aliens will now sometimes attack your interceptor bases, using a map previously available only to MP games. Failure to defend your bases will mean destruction of and damage to many of your aircraft. Added sort in engineering UI. Items will be categorized by size, then alphabetically. Reworked soldier sort in barracks menus; will now sort down fatigued status soldiers below active and above wounded soldiers, and sort primarily by XP and secondarily by officer rank within each status. Adjusted scrolling behavior in strategy game and savegame menus. Should be a lot easier to use now. For non-Ironman games, added “Restart Mission” option to pause menu (thanks Drakous79 for unocovering this). This offers a way to get out of bug-induced mission problems (like script interruption on the base assault) and also a perhaps somewhat more honest savescumming method, in that you take the mulligan on an entire mission rather than a single shot. More new inventory art. More unique HUD images from JCLewis. Art for the new techs and foundry projects. Brazilian soldiers will now get Brazilian names, rather than Spanish-based ones. Combined English and Australian namelist (please don’t hate me) and two Spanish namelists to make this and the new countries happen. Added a bunch of names to multiple nationalities for more variety. Premission squads are loaded blank. Your premission squad will now be saved if you leave the dropship room and return. Completing the Exalt HQ assault will net three unique items, a really nice scope (an improved illuminator gunsight usable by any soldier; old IG no longer buildable) and items that respectively grant 20% bonus XP and PsiXP whenever carried on missions. Gauss Weapons will now use Reaper Ammo sound and visual effects to differentiate them better from ballistics. Reaper Ammo will no longer cause special FX. Added Hit and Run perk, which allows a free shot against a flanked or exposed target (basically works like Close Encounters, except target status rather than proximity is the trigger). Will be available to scouts, assaults and probably MECs. No, it can’t stack with CE (it uses the same resources, for one thing). Added Fire in the Hole rocketeer Perk, which grants 10 aim for purposes of reducing rocket scatter if your soldier has not moved. Grants 10 aim worth of additional range for blaster launcher. Added two cheap Base Security foundry projects, which will allow base security to automatically equip any spare laser rifles and phalanx armors during an XCOM HQ assault. Note these will only help if you have unequipped instances of these items in storage. Geoscape will pause when new recruits arrive. In rare cases you will get landed assault carriers. These will use battleship maps (which have fires and damage because we only have shot-down battleship maps available to us). Added ini settings to set costs (meld, money and days in the tank) for genemods. Also added ini settings to set extra fatigue timeout for individual genemods and psi powers, and fatigue timeout per officer rank. Beta 14 should not require a campaign restart; however, a new campaign is recommended for a balanced and less buggy experience. Fix to soldier heads can cause CTD in the tactical game. IF A SOLDIER HAS NO PAWN APPEAR IN THE DROPSHIP SCREEN, THE WORKAROUND IS TO CHANGE THE RACE/ETHNICITY OF THESE SOLDIERS (and change it back if desired), WHICH RESETS THEIR HEAD TO A DEFAULT. IF YOU DO NOT DO THIS, YOU WILL GET CRASHES IN THE TACTICAL GAME. Changes to perk trees will not take effect for existing soldiers, as usual. Changes to power consumption might leave you with base power deficiencies requiring more generators. XCOM Soldiers with Mind Control perk will lose the perk (and get Fire in the Hole Instead). Currently unsure they will be able to retrain it, but they can add it with console command GivePerk 100 or GivePerk PsiControl. Changes to Psi Perk tree (swap of Mind Merge and Neural Feedback) might require retraining in some cases. On normal and classic difficulties, new XCOM soldiers no longer get a defense bonus; instead all aliens get an equivalent aim penalty. This will mean existing soldiers will be very hard to hit (as they will maintain their defense, but the aliens will all lose aim). Player upgrading mid-campaign may want to adjust ini values to compensate.